Central Switzerland was not just the cradle of the Swiss nation. It was also where the country's national anthem was born. In the summer of 1841, Alberich Zwyssig (1808-1854), a priest and composer from Uri, was staying with his brother in the "Hof St. Carl", a magnificent mansion just outside Zug. He composed the "Swiss psalm" as early as 1841, with lyrics from Leonhard Widmer, in those peaceful and secluded surroundings. However, numerous attempts to make this popular song the Swiss national anthem initially failed. Not until 1961 did the Federal Council decide that the "psalm" should provisionally become the national anthem. It was twenty years before it definitely replaced "Rufst du, mein Vaterland" ("When you call, my homeland") as the national anthem. 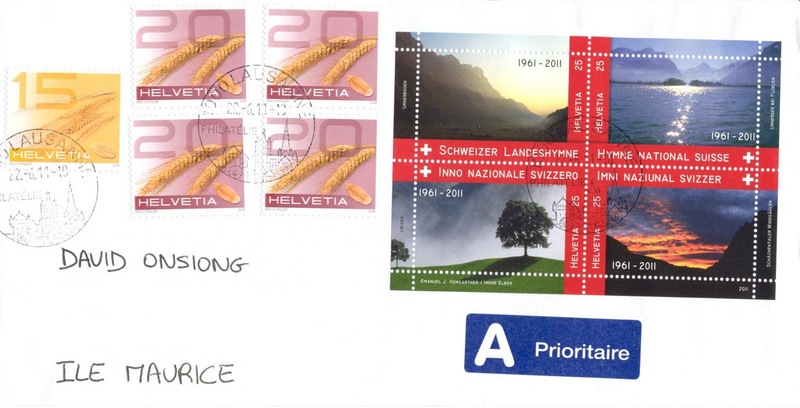 Swiss Post decided to mark the 5oth anniversary of the Swiss national anthem by issuing on May 5, 2011 a miniature sheet of 4 stamps of denomination CHF 0.25 each. The first verse of the Swiss psalm is watermarked on each stamp in the 4 official languages of the country, namely: German, French, Italian and Romansh. It is this miniature sheet which is affixed on this envelope kindly sent from Lausanne - with a nice philatelic cachet - to my address by David.